Power solutions company Wärtsilä has been awarded a contract to supply two complete power plants with a total output of 250 MW for Estonian transmission system operator Elering AS. The total value of the order is 129 million euros. The first power plant is scheduled to be in operation in the spring 2013, with the second unit due to be operational by the autumn 2014. Wärtsilä announced earlier this month that its tender was declared successful in the public procurement process for Elering Emergency Reserve Power Plant. The process has now been finalized, reports LETA/Reuters. The power plants will provide dynamic generation capacity to meet sudden and unexpected drops in the electricity supply. The power plant project is part of the Estonian electricity sector's development plan to have new dynamic power stations available for operation by 2018 in order to guarantee security of the nation's electricity supply. 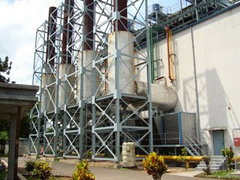 The requirement for these plants is that they have to be able to compensate for lost generating capacity in no more than 15 minutes in the event of a plant shut down. The ten-minute start-up capability of the Wärtsilä power plants is, therefore, essential. The power plants are based on Wärtsilä 20V34DF engines, which will operate primarily on natural gas but with the option to switch to light fuel oil as a back-up fuel. These dynamic grid stability plants will operate on average of 200 hours per year. The contract also includes a two year maintenance agreement, with an option of ten years extension. "This is an important project for the Estonian energy sector, and one that will ensure the supply of electricity to consumers should any existing power station unexpectedly lose production. The capacity of the new plants is equal to one-sixth of Estonia's peak demand, so in an emergency they will be able to cover a large part of the capital, Tallinn's, winter electricity consumption," says Taavi Veskimägi, Elering's Chairman. "This grid stability power plant project is an excellent example of Wärtsilä's ability to provide smart power generation solutions. It meets the needs of the customer in terms of fuel and operational flexibility, as well as providing a reliable means of securing Estonia's electricity supply," says Mr Vesa Riihimäki, Group Vice President, Wärtsilä Power Plants. The plants will be connected to Estonia's 110kV and 330kV grid, and the project is the first full turnkey engineering, procurement and construction endeavor to be built in the country under the new EU regulations. The power plants will be optimally located close to the Kiisa substation, about 25 kilometers from Tallinn. The advantage of this region is the strong connections from this substation through high-voltage lines to the other substations in Estonia. Wärtsilä has been present in Estonia since 2005, providing sales and services to customers throughout the Baltic region. Globally, Wärtsilä has delivered 4,500 power plants in 168 countries with generating capacity totaling more than 47 GW. In 2010, Wärtsilä's net sales totaled 4.6 billion euros with more than 17,500 employees. The company has operations in 160 locations in 70 countries around the world. Wärtsilä is listed on the NASDAQ OMX Helsinki, Finland.